While the hot air was let out of the housing bubble in the U.S. between 2007 and 2011, in Canada, after a minor ripple between 2008 and 2009, home prices continued soaring – to this very day. In August, they rose another 0.8%. Over the last 14 years, prices have increased by 150%, twice as fast as in the U.S…[and] far outpacing household incomes. Any increase in interest rates would prick the bubble, and its implosion would trigger all sorts of mayhem. Indeed, the Canadian government is very concerned that such an event would be a significant risk to the “stability of the financial system”. The above introductory comments are edited excerpts from an article* by Wolf Richter (wolfstreet.com) entitled Is Canada Next? Housing Bubble Threatens ‘Financial Stability’. Home prices in Canada rose more moderately than in the U.S. during the crazy go-go years from 2000 until the financial crisis: in the U.S. they more than doubled in that period, according to the CaseShiller Index, while they rose “only” about 70% in Canada, based on the Teranet–National Bank National Composite House Price Index. 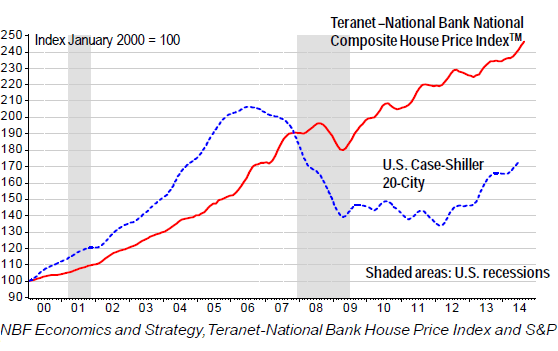 While the hot air was let out of the housing bubble in the U.S. between 2007 and 2011, in Canada, after a minor ripple between 2008 and 2009, home prices continued soaring – to this very day [as can be seen in the chart below]. In August, they rose another 0.8%. Over the last 14 years, prices have increased by 150%, twice as fast as in the U.S..
…In a speech to the Chamber of Commerce and Industry of Saguenay, Quebec, Bank of Canada Deputy Governor Agathe Côté has weighed in on the housing bubble discussing. among other things, the four key responsibilities of the BOC – monetary policy, the financial system, the currency, and funds management. If those two occurred, all heck would break lose. 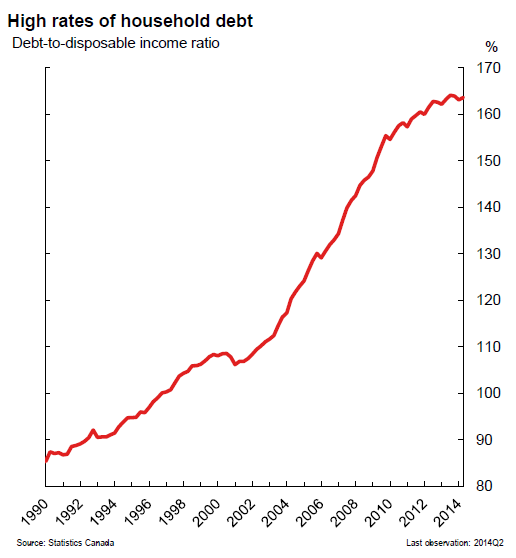 Given the lagging incomes, households have made up the difference with debt, and they’ve gone on a phenomenal borrowing binge, and their indebtedness in relation to their income has skyrocketed and is now hovering at near a record 164%..
Home-price bubbles are treacherous. High household debt relative to disposable income has made the market more susceptible to market stresses like unemployment or interest rate increases. Low interest rates have been heating up the market yet any raising of them would prick the bubble, and its implosion would trigger all sorts of mayhem. Now imagine what even just slightly higher interest rates would do to households barely able to shoulder this mountain of debt, and what they would do to home prices as demand would be systematically strangled. The federal government…[has tried to] cool down the market…[by] shortening amortization periods to 25 years from 40 years and tightening the eligibility for government-backed mortgage insurance… [in an effort to] “engineer a soft landing” [but to no avail]. Bubbles don’t land softly, they implode, and it’s a brutal process. The longer bubbles are maintained, the more brutal their implosion and housing bubbles are particularly vicious: they’re accompanied by a construction boom, which contributes enormously to the economy in myriad direct and indirect ways – from well-paid construction jobs to pickup truck sales. 1. Canada’s Housing World’s Most OverValued – Where Does Your Country Rank? 2. Is a Real Estate Bust Coming to Canada – Finally? 3. Home Price Appreciation Highest In New Zealand, Canada & Australia. Where Do U.S. & U.K. Rank? 4. Canadian Debt-to-Income Ratio Has Entered the Danger Zone! Is a Housing Crash Imminent? 6. 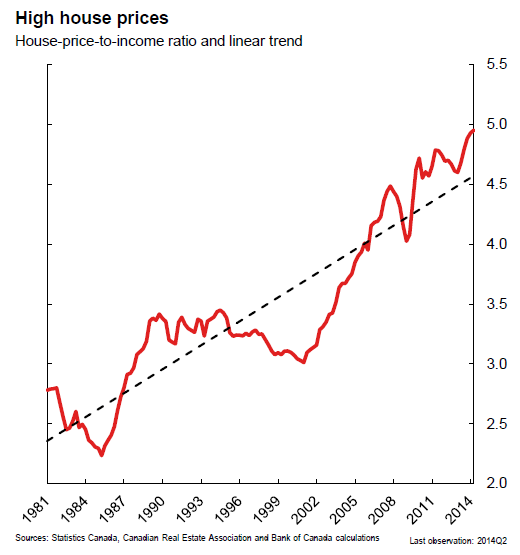 Still NO Housing Bubble in Canada – So What Will Cause Prices to Finally Correct? 7. Are Surging Home Prices in Canada Finally Due For a Major Correction? 8. Will Canada Soon See a 20-30% Correction in House Prices? 10. Unlike the U.S and U.K, Canada’s Home Prices Are STILL Rising!